I haven’t watched actual television in… months. So I completely missed, until today, the newest reality show that would potentially hold my interest (because reality shows really are not my thing). It was complete happenstance that I came across a trailer for it on Facebook this afternoon. The same day it premiered. I won’t lie – one of the reasons I don’t enjoy reality television is because the people in it are idiots. But I’m starting to fall in love with this incarnation of reality tv. Because I can identify with the people who are competing. They are readers, homeschoolers, and survivors. Literally – one girl (Bonnie Gordon) was born with twisted legs and had to wear leg braces for several years. These are the people who turned to fantasy as a refuge. And let’s be honest – that’s why most of us turned to fantasy, especially at young ages. The Quest is a new reality adventure that takes 12 lucky contestants on the journey of a lifetime when they enter the world of “Everealm.” For The Quest, the Executive Producer of the blockbuster movie franchise The Lord of the Rings has joined forces with the creators and producers of The Amazing Race to conjure a land of magic and malevolence, where mythical creatures lurk in the woods, agents of darkness stir in the shadows, and mystical beings infiltrate the keep. For 12 lucky souls, a fantastic world will come alive in a unique competition series where players will engage in epic challenges. Fantasy meets reality when one player emerges as a real-life hero. The Quest is from executive producers Bertram van Munster and Elise Doganieri (The Amazing Race, Profiles Television), executive producers Mark Ordesky and Jane Fleming (Court Five), and executive producers Rob Eric and Michael Williams (Green Harbor Productions). There’s this world, Everealm. It consists of 12 Kingdoms (which ‘have lived in harmony for centuries’) are under siege from Verlox the Darkness (yes, I am totally guessing on the spelling of that name). The challenge starts – after the twelve Paladins are explained their quest by the Fates – in the Kingdom of Saenctum. The quest? The twelve Paladins must reclaim the ‘Sunspear’ and vanquish evil from the land, of course! Hubby says it looks like Dragon Age. I say it’s just full of fantasy tropes and clichés, but that’s going to be half the fun, I think. What do I think makes this reality show stand above the rest? There’s a story line. These people actually have to participate, instead of just pair up and make alliances. Most of these participants actually think. They are thrilled to be in a situation where most modern amenities have been stripped away – instead of shocked that they can’t use a phone. They want to forced to think outside of their everyday boxes, and are so excited they might get to be the hero. What would be a fantastic plot twist in the end, I think? If the hero has to give up everything to ‘win’. Because that’s the way a lot of fantasy stories end, right? WARNING – HERE BE SPOILERS! ‘The Quest Begins’ was a lot of fun. The producers really went all out to make this fantasy world believable. We of course start out with the participants – I’m sorry, paladins – receiving their (obviously staged) summons, and then there was a journey far away, deep underground, and into Everealm. The Fates were first encountered in that underground, and the paladins found themselves in the middle of the forest in the middle of the night avoiding enemy soldiers as they made their way to the castle in Saenctum, led by Crion. There was the obligatory death-by-troll (Crion’s assistant) along the way. Upon arrival in the town around the castle, the paladins are (surprise!) thrown into the city ‘prison’ (according to a couple of the players, but that was the nicest prison I’ve ever seen…) while their fate is decided by the authorities. One of them expressed surprise that they – the chosen paladins! – were treated in such a manner. I pretty much burst out laughing and wondered if that paladin had ever actually read a fantasy novel. After getting settled into their quarters, and one night of rest, they were led into the first challenge – to begin training to be soldiers. I didn’t catch if they were using crossbow machines or whatever-you-call-em, but basically the paladins were split into teams, and whoever took out the most enemy soldier dummies won, and the team who took out the least would have to ‘pay the consequences’. I can’t recall what the winning team was called (was it the white team, or the yellow team? ), but I think it was Bonnie’s team, and she was awarded the ‘Mark of Leadership’ for that challenge. We are then informed that there are twelve marks in total to be earned throughout the quest, each one representing a different kingdom and a different virtue. Obviously, this mark represented Saenctum as well as leadership. It wasn’t until that night, after everyone returned to the castle, that the ‘consequences’ were explained. The paladins were led to the Hall of the Fates, and the team that failed the challenge earlier in the day was given one more challenge, wherein they essentially had to eliminate each other. Katie was the paladin eliminated in the first round. I’m not sure how I feel about it yet. She was one of the quieter participants on the show, it seemed, but she reminded me a lot of me – she created worlds and languages with her sister as a child. And I’ll just go official now and say it – I don’t like Christian’s attitude. He rubs me the wrong way, in the actual episode, and in all the trailers/previews. We’ll see how this pans out over the season. 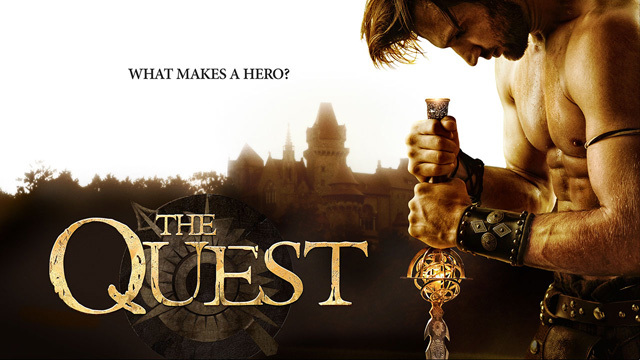 Did you watch The Quest tonight? What did you think (of anything – the concept, the setting, the props, etc.)? Previous It’s Raining Cats & Dogs! Next Puppy name, and miscellany! It sounds amusing, at any rate. I have to admit, I’m not a reality tv person, but this does sound quite amusing. I think this was previewed on the season finale of Once Upon a Time, natural tie-in, and I was interested at the time. Haven’t watched much but netflix all summer. Had almost forgotten there was such a thing as network tv so far this summer. Maybe I’ll catch up on abc.com!